Yubi Power Here's a great way to keep intruders away from your home or business! Our Yubi Power Theft Prevention Kit comes with 4 dummy surveillance cameras and 2 dummy dome cameras for a look of heavy security. With a truly realistic looking camera and active looking domes you are sure to fool any would be criminal. Why would a prowler take a chance with a seemingly protected property? It's easier to move on. It's just not worth the risk! Now that's a great deterrent against break-ins and theft! So for a great sense of security at a fraction of the cost of a real surveillance systems opt for our fake but realistic looking dummy cameras in this complete theft prevention kit. Yubi Power's high quality simulated security surveillance cameras are a proven crime prevention and deterrent device. Features Realistic appearance, looks just like a real security surveillance camera. Perfect for both outdoor and indoor use. (Solar will not charge rechargeable batteries indoors) Flashing red light alerts and deters intruders. Uses two regular or rechargeable AA batteries. Easy and simple to install and use. Effective and inexpensive way to deter criminals. Yubi Power YB-250 Fake Outdoor Dome Surveillance Dummy Security Cameras with Blinking IR Lights Looking for an option in home or business security? OurYubi Power YB-250 Fake Outdoor Dome Surveillance Dummy Security Camera is a great option. The dome camera is a completely realistic looking surveillance camera that can easily fool any would be criminals. 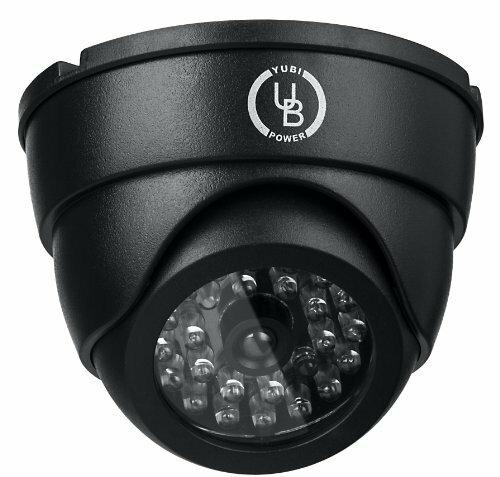 Utilizing blinking red IR lights the the Yubi Power Dome Camera appears to be operating and tracking your every move thereby deterring criminal activities in your surrounding area. With Yubi Power's high quality simulated security surveillance cameras are a proven crime prevention and deterrent device. They are already widely used by numerous business, including car dealerships, factories, stores, warehouses, restaurants, and even hotels. Now you can have professional safety and security of an expensive surveillance security camera at the fraction of the cost. Features Realistic appearance, looks just like a real security surveillance camera. Perfect for both outdoor and indoor use. (Solar will not charge rechargeable batteries indoors) Flashing red light alerts and deters intruders. Uses two regular or rechargable AA batteries. Easy and simple to install and use. Effective and inexpensive way to deter criminals. 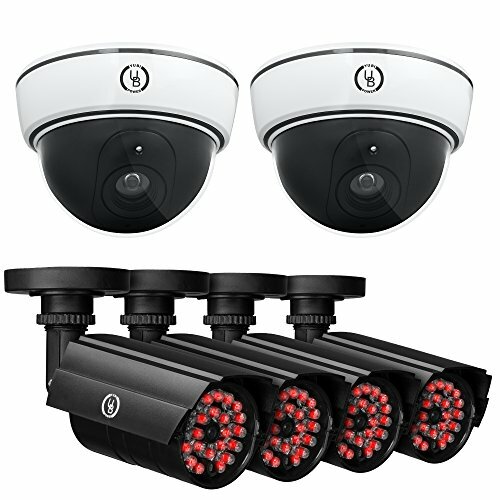 Yubi Power Security Bundle of 8 Fake Outdoor Surveillance Dummy Cameras with Blinking IR Lights Are you looking for the optimal in security cameras for your home or business? 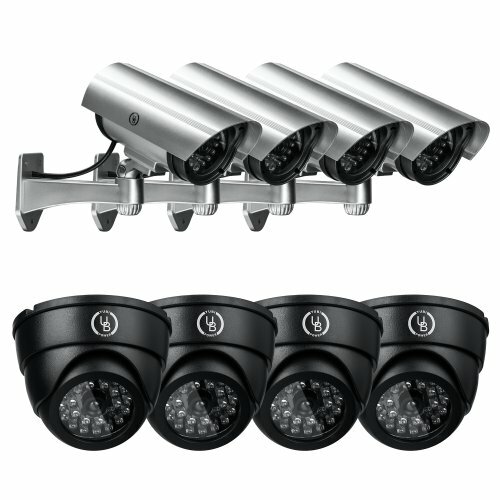 Look no further than Yubi Power Security Bundle of 8 Fake Outdoor Surveillance Dummy Cameras . This is the complete package. It includes four black realistic dome cameras plus four sleek surveillance cameras all with blinking red IR lights. They are so genuine looking that any would be criminal will think twice before coming onto your property. With this bundle you will appear well guarded form all sides leaving no area to look unprotected. It does wonders to scare off trespassers, prowlers, vandals, and all sort of criminal activities form around your home or office. With Yubi Power Security Bundle of 8 Surveillance Dummy Cameras you can feel more secure and safe. Our Yubi Power's high quality simulated security surveillance cameras are a proven crime prevention and deterrent device. They are already widely used by numerous business, including car dealerships, factories, stores, warehouses, restaurants, and even hotels. Now you can have professional safety and security of an expensive surveillance security camera at the fraction of the cost. Features Realistic appearance, looks just like a real security surveillance camera. Perfect for both outdoor and indoor use. (Solar will not charge rechargeable batteries indoors) Flashing red light alerts and deters intruders. Uses two regular or rechargeable AA batteries. Easy and simple to install and use. Effective and inexpensive way to deter criminals.